Six years ago, as the historic Marks-Rothenberg Building in downtown Meridian was being restored to house the Riley Center, along with the historic Opera House next door, another major component in the master plan was turning the nearby Threefoot Building into a hotel to service the Riley Center. Today, the centerpiece of Meridian’s skyline, built by members of the local Jewish community in the 1920s, remains vacant and largely untouched — and is now on the National Trust for Historic Preservation’s list of America’s 11 Most Endangered Historic Places. The building was previously on the Mississippi Heritage Trust’s list of most endangered historic places in the state, and the state group submitted the Threefoot Building for the national list, which includes Wilderness Battlefield in Virginia, and Metropolitan AME Church in Washington, where Rosa Parks’ funeral was held. In 2006, a contract was signed to purchase and develop the building, which had been vacant since 2000. Shortly after current mayor Cheri Barry took office, a developer pulled out, claiming a lack of support from the city. The agreement included city backing of a portion of the project’s financing. Last month, Barry stated that plans are to stabilize the building and hold onto it for future renovation, especially given the current economic climate. The Threefoot Building was immortalized by Ripley’s Believe It Or Not as “a 15-story building on a three foot lot,” playing off the name of the prominent Jewish family that developed it. 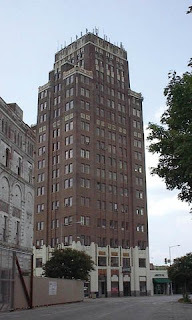 The building, located at 22nd Avenue and 6th Street, was both the pinnacle and the downfall of the family. In the 1920s, Sam Threefoot and his family built Meridian’s only skyscraper, an Art Deco building that was completed in 1928 on the previous site of the Threefoot Brothers Wholesale Company. The Great Depression then hit, depressing the building’s occupancy rate. The building became a drain on the family’s finances, and the family lost the building. It continued on as an office building, but suburban development in the 1960s and 1970s led to downtown’s decline. The building is also on the National Register of Historic Places.